Boss Bob Paine says East Preston must be more clinical when leading in matches. EP saw a two goal lead come and go as they were held to a 2-2 SCFL Premier Division home draw with Hassocks on Tuesday. Paine’s team, on the back of a crushing 7-1 league triumph at struggling Eastbourne United last time out, looked to be on their way to a second successive win as first half efforts from Lucas Pattenden and Tom Lyne put them 2-0 ahead. However Robins would storm back, netting twice through Dan Stokes in the final ten minutes as it ended all square. It could have been worse for East Preston. Goalkeeper James Fernandes was shown a straight red card with the score at 2-1 and Hassocks awarded a penalty. Substitute Leesun Donaldson came on to replace Fernandes in the sticks, saving the spot-kick with his first touch. Boss Paine came away with mixed feelings following the draw, admitting his team should have been out of sight after a dominant first-half performance. He said: “It felt like a defeat in the dressing room after the match. We put so much in over the first 45 minutes, were dominant and should have been leading by more than the two goals we were. “Hassocks are a lot stronger this season so we were wary of the threat they would pose in the second half. “I thought we’d weathered the storm, still leading 2-0 with just over ten minutes to go. “They got one back, then James (Fernandes) was sent off, rather harshly in my opinion and they had a penalty. Leesun (Donaldson) did superbly coming on and saving the penalty, then you think ‘this is our night’. Wing-back Pattenden fired the home side ahead after three minutes then defender Lyne got another nine minutes before the break. East Preston would have felt they should have led by more than the two goals they did, having been so dominant. Hassocks were much better after the restart but couldn’t get one back until Stoke struck ten minutes, which sparked a crazy spell. Fernandes was given his marching orders after a Robins player beat him to the ball. Donaldson came on to replace Quirke, going in goal, saving the resulting spot-kick. East Preston couldn’t see it out, though, Stokes netting again a minute from time as it ended 2-2. 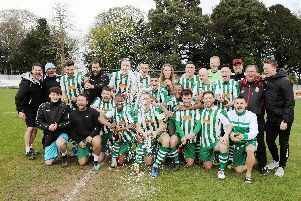 EP now turn their attentions to the FA Vase with league rivals Broadbridge Heath visiting for a first round qualifying clash on Saturday. EAST PRESTON: Fernandes; DaCosta, Lyne, Jenkins; Pattenden, Lelliott, Quirke, Barnes, Beaney; Huet, Brodie. Subs: Tilley (Brodie, 65), Donaldson (Quirke, 85), Rafferty, Heryet, Etherington.